The farmhouse and farm buildings of Higher Farm, or Higher Preston Farm, were located at the western end of Preston Plucknett on the southern side of Preston Lane (today's Preston Road) while the fields of the farm were scattered between Preston lane and West Coker Road, as seen on the map below. Much of the farm was bought by the Air Ministry in 1939, leading to its demise as a working farm. The farmhouse still exists and most of the old farm buildings are today used as small industrial units and workshops. 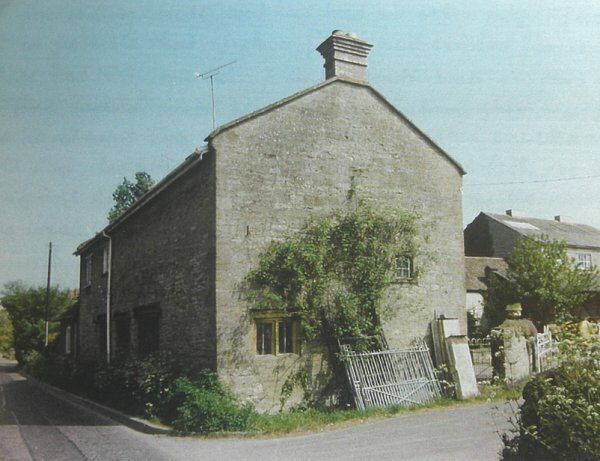 Farmhouse, built 1649, but subsequently modified Ham Stone, random coursed with fine face; plain Clay tile roof between coped gables, 2 end chimneys and one off centre rebuilt in brick. Main South facade has irregular fenestration. 2-storeys, with one 4-light stone mullioned window with ovolo mouldings and label over, off-centre door (relocated) and on right-hand two 2-light mullioned windows with hollow chamfers; on first floor 5-C20 double windows. On North (street) facade two 3-light and one 4-light stone mullioned windows with large rectangular leaded panes, hollow chamfer moulded with labels over; at first floor level two 3-light wooden casements, one with ovolo mouldings, both with leaded panes. Interior not inspected, but Sir R Hall refers to lintol in kitchen fireplace dated 1649, and to elm ceiling beams with scroll stops to chamfers. The house can be traced back in documents to 1649 when, in a book of grants for the manor, (which then belonged to the de Waldegrave family) John Buckland Esq surrendered a house known as "late Thomas Whittle's" and a new lease was given to John Mitchell and, after his death, to his wife Agnes and son Richard for their lives. The date of 1649 on the fireplace may just commemorate the entering of the lease, but the general features of the house and in particular the door frame, older windows and the ceiling beam suggest that it was indeed built about that time. At this time there were only about 44 acres of land associated with the farm and these were scattered all over the manor, from Thorne Lane to West Coker Road. John Mitchell, mentioned above, leased a further 17 acres in 1659 which had been occupied by Morgan and John Hacker. John Mitchell's son, Symon, eventually obtained a lease on a further 24 acres previously in the occupation of the Keymer family. The lands of these two leases were similarly widely distributed across the manor. For all these lands annual rents of something less than a shilling per acre were paid although a large 'fine' was paid when the lease was executed and further smaller 'fines' were paid when the leases were extended by bringing in new lives. For example a 'fine' of £210 was paid for the Keymer leases. By 1725, when the Waldegraves sold the manor, the annual value of the three properties was given as £78, or just under £1 per acre. Following this the three leases were inherited by John Mitchell Cleeves of North Perrott who died around 1790. At this time his tenant farmer was George Connock. The Earl of Westmoreland, who had bought Preston Plucknett in 1762, did not renew the leases but instead gave out a tenancy. This was initially to George Connock and then, in 1794, to Thomas Connock. At some time during this period the Preston Plucknett lands were redistributed into compact farms - this having previously been impossible while the scattered lease-holdings existed. There is some slight evidence for there having been two stages of this redistribution; in the first of which it appears that Higher Farm was mostly between the village and the later railway, and in the latter stage, mostly on the slopes leading up to West Coker Road. By 1821 Thomas Connock was farming 175 acres and the rent was £1 15s an acre (around £1,300 at today's value). In 1824 Benjamin Dunn succeeded him, and a complete picture of the farm is given in the first tithe survey of 1837. There was a narrow strip running down to the Brympton Brook, and all the rest was beyond. Nearly half the farm was arable, especially on the higher land on both sides of Bunford Hollow. 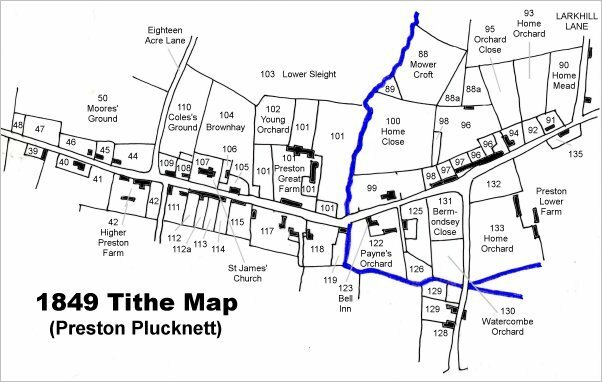 By the time of the 1848 Tithe Apportionment and the 1849 Tithe Map of Preston Plucknett most of Higher Farm - 118a 2r 11p - was owned by Lady Georgiana Fane of Brympton d'Evercy and farmed by her tenant farmer Benjamin Dunn, who himself also owned 4a 1r 11p in three separate parcels (shown shaded a slightly darker shade of green on the map below). A glance at the map below showing the usage of the fields shows that, somewhat surprisingly, there are only two meadows, possibly indicating the the farm only became a dairy farm later in the nineteenth century. By the 1890s the tenant farmer was Sidney Martin. Unfortunately Sidney was declared bankrupt in 1896 and his herd of 58 dairy cows, 7 calves and a bull were auctioned, together with 9 horses, sheep, pigs and farm machinery and implements. As well as 50 hogsheads of cider - just under 21,000 pints! (see sale notice below). During the 1920s Higher Farm was farmed by George Loder, who died in 1927, it was then farmed by Phillip Salisbury. However in 1939, with the approach of the Second World War, most of the farm was acquired by the Air Ministry in order to expand the Westland airfield. As a consequence the stock and equipment was, once again, sold off. The report of the sale, reproduced in full below, is interesting for not only what animals and equipment a medium-sized dairy farm would hold at this time, but also the prices realised at the sale. 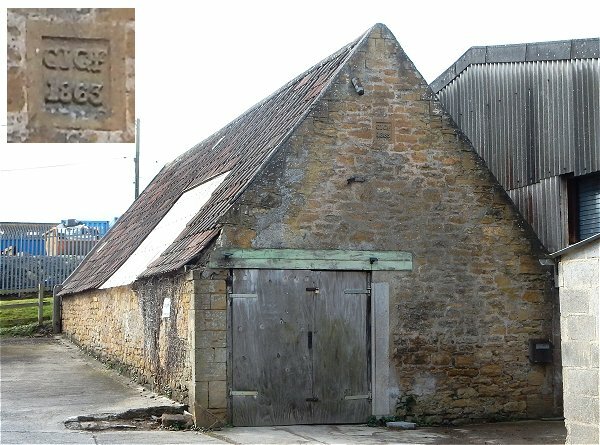 The farmhouse still exists and most of the old farm buildings are today used as small industrial units and workshops. Below are tabulated the Parcels associated with Higher Farm at the time of the Preston Plucknett Tithe Apportionment of 1848. It will be seen that Benjamin Dunn had acquired three small parcels (26, 32 and 37) of his own, shown as a darker green on the map, based on the Tithe Map of the following year, below. 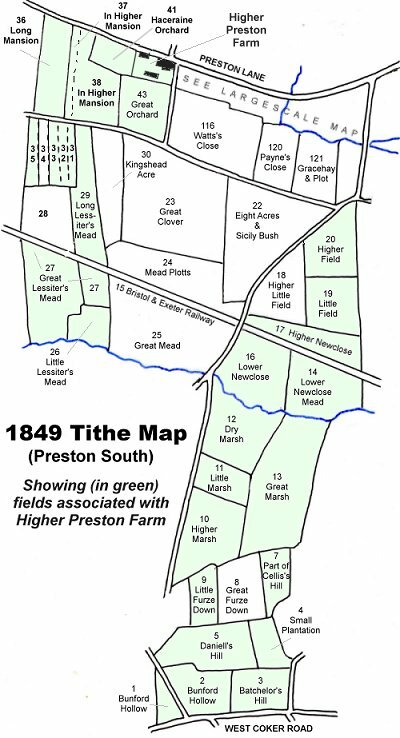 The 1849 Tithe Map of Preston Plucknett village, showing the location of Higher Farm (Parcel 42), towards the west end of the village, on the south of Preston Lane (today's Preston Road). This map, based on the 1849 Tithe Map of Preston Plucknett, shows the parcels of land associated with higher Preston Farm; those shaded light green owned by Lady Georgiana Fane and those shaded a slightly darker shade of green owned by Benjamin Dunn. 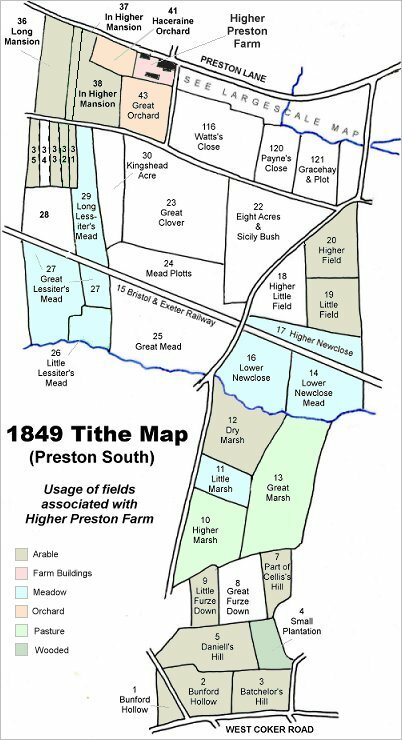 This map, again based on the 1849 Tithe Map of Preston Plucknett, shows the usage distribution of the land of the farm. Not surprising is that the orchards were close to the farm buildings (two more orchards were on the north of Preston Lane, just off the map) and the meadows were close to the stream since that was the only kind of land on which hay grew in any quantity. What is surprising is that there are only two meadows, possibly indicating the the farm only became a dairy farm later in the nineteenth century. 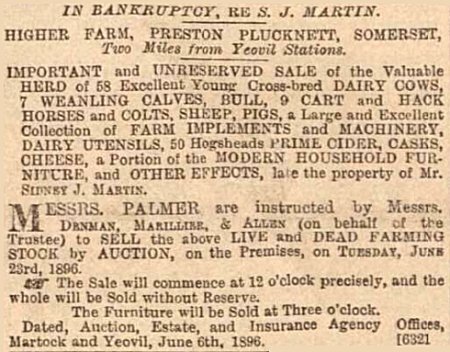 The notice of sale of the stock and equipment of Higher Farm, due to the bankruptcy of farmer Sidney Martin, advertised in the 12 June 1896 edition of the Western Gazette. The notice of sale of the stock and equipment of Higher Farm, due to most of the farm having been acquired by the Air Ministry, advertised in the 1 December 1939 edition of the Western Gazette. Higher Farm, photographed in the 1990s. .... and the current view 'borrowed' from Google Street View. 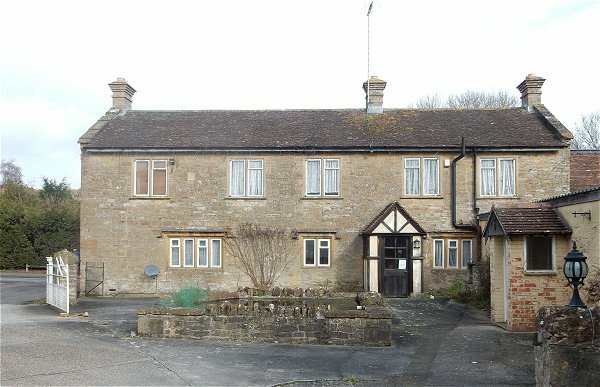 The 'front' of the farmhouse faces away from the main road. The porch and first floor windows are modern but the ground floor windows appear to be original. Photographed 2016. 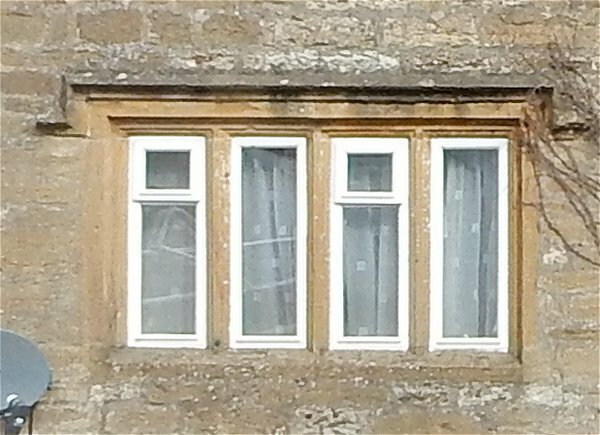 Detail of the 4-light stone mullioned window with ovolo mouldings. Photographed 2016.